By day, Jeff Delfield is the Librarian at Bryson City’s Marianna Black Library. And in his spare time, he’s a maker of unique hand-crafted musical instruments, filling requests from as far away as Australia. Above, he’s putting the finishing touches on a tackhead banjo with a distinctive “patchwork quilt” design — a specific request of the buyer. To achieve the multicolored pattern, Jeff constructed the rim from eight different woods. And to fully display the beauty of the woodwork, he hid the head tensioning system on the inside of the rim, a technique he borrowed from the makers of Irish Bodhrán drums. The head is calfskin, the neck walnut and the fretboard is made of bloodwood. Jeff makes just one instrument at a time, a process that usually takes about six weeks. 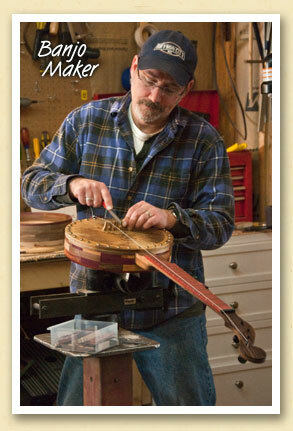 You can see more of his hand-crafted folk instruments, including videos, on his Deep Creek Strings website. Awesome! I will have to order one of them.